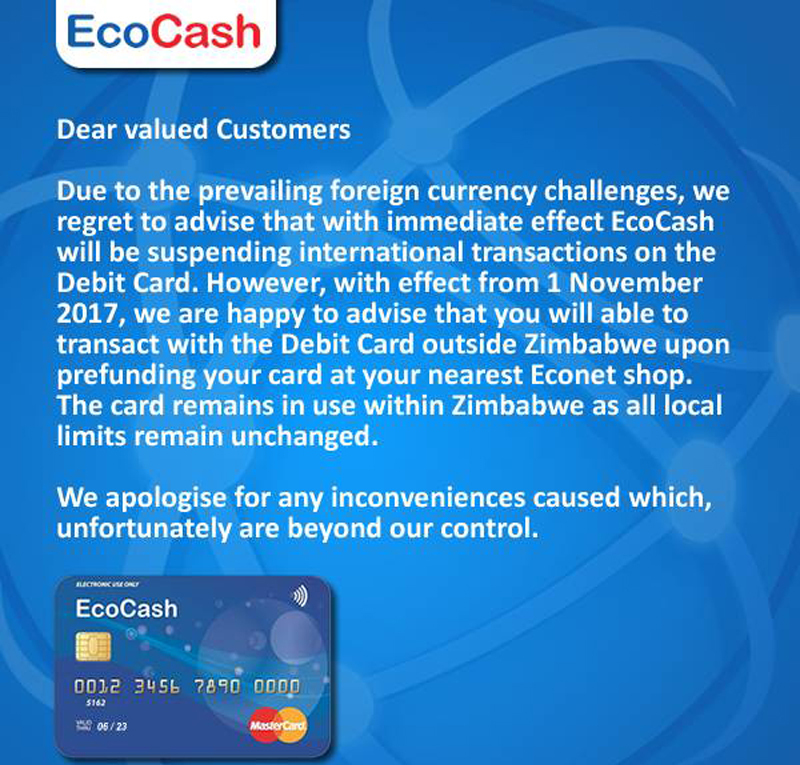 Mobile money payment solution Ecocash has sent out an announcement that they have suspended international transactions on their MasterCard debit card with immediate effect. It is not all doom and gloom though as they reassure people that come November 1, 2017, they’ll be back up and running, though you’ll need to pre-fund that card with US dollars. This has been some time coming as Ecocash have regressively reduced the amounts that their customers could transact with their card, first down from $5,500 to $1,100 then down to $500 and shortly after to $400, which it then went down to $50 and most recently one could only transact to the tune of $25 per month. They then went to cancel their Virtual Card Number, a digital MasterCard that allowed one to make online payments and to this day it is still inactive. Techzim has reached out to Ecocash to establish what does “pre-funding” mean, whether USD’s, bond notes or RTGS. (UPDATE: Ecocash have confirmed that one will have to fund this account with physical US dollars). Further, we’ve asked whether the VCN will be resurrected come November 1 (UPDATE: Ecocash advise that all services including the VCN will be restored. Limits on the card will be advised based on approvals from the Reserve Bank of Zimbabwe). Its ‘powering’ bank, Steward Bank adjusted to the realities a couple of months ago and now has asked their customers to ‘pre-fund’ their accounts with cash, be it US dollars or bond notes. So what if EcoCash only allows me to buy airtime for a dollar and above??? Prefunding should also include bondnotes since RBZ insists that bond and us$ are equal. It seems ecocash have upped their tariffs very quietly ? ?